Part of the building belonging to the suspected kidnapper, Eze ego, being demolished. 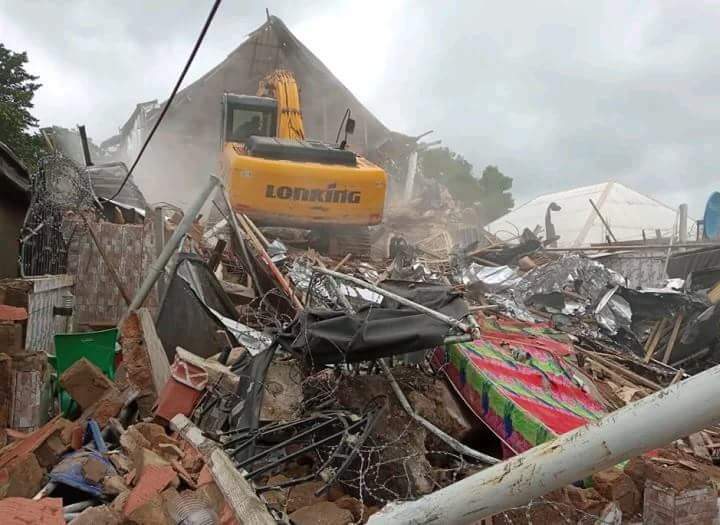 Not less than six houses belonging a suspected leader of a kidnap gang, Ikenna Nwosu, popularly known as “Eze ego” have been demolished by the Imo state government. The Imo state Police Public Relation Officer ,PPRO, Andrew Enwerem, Sunday confirmed this to Vanguard in Owerri. Recall that Vanguard reported that Eze ego, 43-year-old, native of Okwudo, Mgbidi in Oru West Local Government Area in state, confessed that he led a gang that kidnapped and murdered, a politician in the state, Mr Amos Akano. Eze ego, also claimed that they collected N5million as ransom. According to Enwerem, said: “You know there is this report of a kidnap and murder of one Amos Akano, from Nkwerre. In the course of investigation operatives of the Federal SARS, Imo command rounded five of the suspected and confessed to the crime. “The Imo state government, inline with the state law, of suspects involving in kidnapping so the Imo state government acted on law and carried out a demolition excercise belonging to the notorious kidnap suspects. “About six houses were demolished by the state government. The people of Oru west turned out en mass and jubilate for what they government has done.